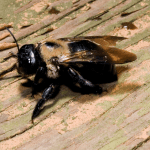 Carpenter Bees Removal Suffolk County | EcoTech Pest Control Inc.
Carpenter bees are often mistaken for bumble bees. The main difference is that with CARPENTER BEES, the upper surface of their abdomen is bare and shiny black; bumble bees have a hairy abdomen with at least some yellow markings. Another easy way to tell the difference between the two is that the nests of the two types of bees are different. Bumble bees usually nest in the ground. If you have CARPENTER BEES, you will likely notice one or more bees just hovering around a roof, fence or deck. This is due to the fact that the males hover outside around the nest while the Mrs. is drilling their nest into a nearby piece of wood. CARPENTER BEES tunnel into the wood to lay their eggs. Bare, unpainted or weathered pieces of wood are what they prefer. Painted or pressure-treated wood is less likely to attract CARPENTER BEES. Common nesting sites include eaves of houses, garages or sheds, window trim, fascia boards, wood siding, wooden shakes, decks, fences and wooden outdoor furniture. Carpenter bees overwinter as adults inside abandoned nest tunnels. They emerge in the spring, usually around April or May. After mating, females drill perfectly round holes into a piece of wood, and once about an inch into the wood, they turn and go left and right, digging tunnels inside the wood. They then lay their eggs within a series of small cells at the end of tunnels. The cells are stocked with pollen on which the larvae feed, emerging as adults in late summer. The entrance hole and tunnels are perfectly round and about the diameter of your finger. The tunneling produces sawdust about the color of fresh cut wood, which will be present beneath the entry hole, and burrowing/drilling sounds may be heard from within the wood while they dig. IT IS NOT RECOMMENDED THAT YOU ATTEMPT TO TREAT ANY BEE OR WASP NEST IF YOU ARE NOT A TRAINED PROFESSIONAL. A trained EcoTech Professional can eliminate and remove any nest without exposing you or your loved ones to harmful chemicals.